Faith and love have proven themselves to be vast reservoirs of source material for Mindy Smith, but the success of her previous albums drew less from what she wrote about and more from how she approached those subjects. Where lesser talents aimed for the boring sheen all too common to the modern Nashville sound, Smith could effortlessly and comfortably glide between swampy gospel blues, lighthearted pop and alt-country heartbreakers, and this fluidity gave her first three releases not just a sense of adventure but, more importantly, an even stronger sense of character. With Stupid Love, Smith eschews a good deal of those stylistic capers and focuses more on delivering a singer/songwriter album with her narratives and musings front and center, and the end result is an album that trades the bold for the merely pleasant. As a songwriter, Smith’s talents have never been second-guessed (witness her solemn reclamation of “If I Didn’t Know Any Better,” a track she originally wrote for Alison Krauss & Union Station in 2004, or the confident, boozy swagger of “Take a Holiday”), which further complicates the decision to remove so much of the stylistic flourishes from Smith’s recordings. What Stupid Love is left with then are thirteen tracks that sound like bluegrass, country, or gospel but never do a good job of convincing anyone they actually are bluegrass, country or gospel. Which is not to say Stupid Love is necessarily a failure, or even overly bland; witness the soaring redemption of “Couldn’t Stand the Rain” the compact frailty of “I’m Disappointed” or the Tom Petty-esque Americana of “What Love Can Do.” Smith and producers Justin Loucks and Ian Fitchuk obviously understand the power of the music at their disposal, which makes one wonder how this same team arrived at some of the album’s less-than-powerful moments. 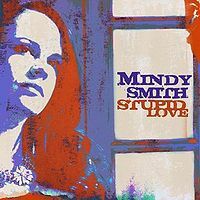 As an album in and of itself, Stupid Love delivers just about what anyone would expect from a typical Nashville singer/songwriter, which is a shame because everyone knows Mindy Smith is actually capable of so much more than the typical Nashville singer/songwriter. Still, in the face of the expertly-crafted melodies in the verses of “Love Chases After Me” or the irresistible Beatles-by-Cash melancholy pop of “What Went Wrong,” adventure and progress can take comfort in their momentary uselessness.